Solid Snake finally gets some face time on the big screen. Okay, so this might not exactly be “the” Metal Gear movie that everyone is dying to see, but for a fan made film, this one certainly hits all the right notes. 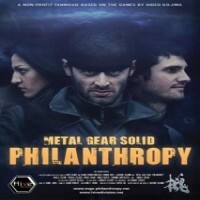 Metal Gear Solid: Philanthropy is a low budget film created by a group of young Italian students and filmmakers. They dub themselves as the Hive Division and the group took on a massive undertaking by adapting Hideo Kojima’s Metal Gear Solid videogame into a full blown 70-minute film. For a film with no budget, the effects are awesome and for a split second it will even make you wonder whether it’s necessary to have a Hollywood version at all. Initially started as a “hobby,” production for Metal Gear Solid: Philanthropy had been completely scratched once upon a time. It was salvaged and created into a 30 minute prologue which came out back in 2005. However, for those who decided that making a film about Solid Snake was more than just a hobby, they started and created a completely new Metal Gear Solid: Philanthropy movie. It comes with a new plot, basically stripped of the fluff and nothing but essentials. The result is the first of a planned trilogy running for about 60-70 minutes each. That’s definitely a lot of Solid Snake that fans can look forward to. As expected with any fan-made, low budget film, the acting isn’t spot on, BUT the storyline is pretty original and the quality of the work is really worth raving out. Watching the entire film gives you a similar feel when playing the games, the actor playing Snake definitely knows his stuff and was capable of bringing to life one of the most celebrated faces in the videogame world. The CG work on the film is believable and the action sequences are up to par with the games. Essentially, Metal Gear fans will either love this film or they will hate it. Certainly, Hive Division has plenty of love for this film and apparently, Mr. Kojima also has some love for it. The verdict is that, yes, it could use better actors and better acting. However, as a fan film made through blood, sweat and I’m sure plenty of hard work, this film does justice to the Metal Gear franchise. Hollywood could definitely take some cue from Hive Division. Note from the creators: Metal Gear Solid: Philanthropy is a no budget film made by Hive Division, a collective of Italian students and young filmmakers. It’s a non-profit project, based on the videogame saga Metal Gear Solid, created by Hideo Kojima and published by Konami.